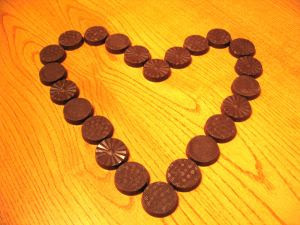 Married To Chocolate: I Heart Chocolate. Chocolates mend broken hearts. Well, sort of. Next time you're visiting someone in the hospital with heart problems, dump the flowers. Head to the candy store instead. A recent study said heart attack victims who ate chocolate two or more times a week were linked to "a 66 percent reduction in cardiac mortality while less frequent consumption was also associated with smaller decreased risks." In simple English: the more they ate chocolate the lesser the chance heart attack victims died of heart-related problems. Eating less chocolate was also linked to a lower rate of not dying of heart-related problems. Another study said anti-oxidant rich chocolate lowered blood pressure in an experiment conducted on mice. The drop in blood pressure was said to be comparable to a popular anti-hypertensive drug called Captopril. Hate to say I told you so, but chocolate is good for you and I told you so.